The Cleat Screw Kit is a BikeFit Pro's best friend. 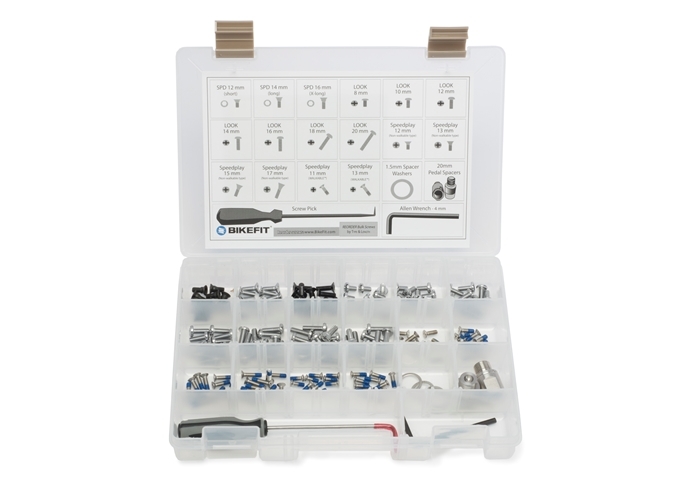 In addition to a Screw Pick, 5 - 1.5mm pedal spacer washers, a pair of 20mm Pedal Spacers and a 4mm Allen key, the kit contains 10 of each of the screws we sell (except for Walkable Speedplay type - see our special Screw kit for them). The Cleat Screw Kit is a Bike Fit Pro's best friend because it eliminates the difficulty (and in some cases impossibility) of finding the perfect type and length of cleat screw. For example, our Speedplay® screws have Loctite® to help prevent them from coming loose. For Walkable™ Speedplay® screws - please see our stand-alone Screw Kit (part# 9092008).